Our smallest friends like rabbits, guinea pigs and hamsters always keep us entertained! 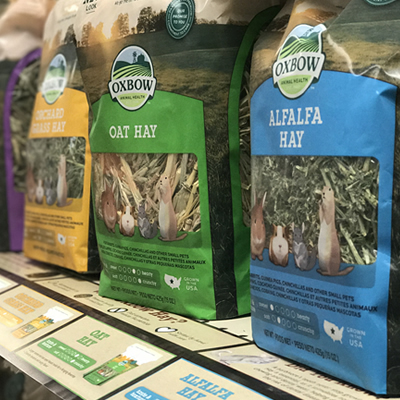 To keep your small animals healthy and happy, we carry a range of nutritional feeds from Oxbow and Purina, specifically formulated for your pets’ life stage and needs. The Grange also has a huge selection of premium small animal hay. Did you know that hay should make up the majority of a small animals’ diet? Let us teach you how to balance pellets, hay and treats to create an optimal diet for your critter. The Small Animal department is also stocked with treats, supplements toys and bedding. Everything you need to provide a healthy, safe home can be found in The Grange. While you are shopping at The Grange, make sure you visit our store bunnies, Inky and Pinky! They love to visit with Grange customers and they really love trying all of our products! Want to know if a particular toy or treat is good? Just ask our rabbits, they’ve tried them all!